Dr. Jerome McKay is a soldier scientist, one of a small and highly specialized group within the U.S. Army, as well as an immunologist at one of the leading respiratory hospitals in the country, National Jewish Health in Denver. The 2001 Hastings College graduate majored in biology, minored in chemistry and was a member of the Hall of Fame Hastings College football teams of 1998 and 1999. 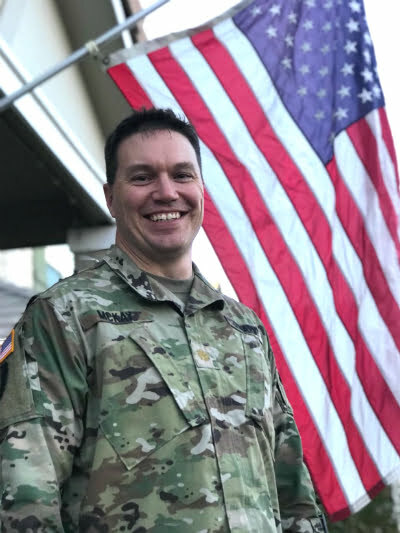 While balancing his role on campus as an honor student-athlete, he devoted time to his career as a medic in the Army Reserve. After serving in Iraq, McKay and his wife Ashley moved to North Carolina, where she matched for internal medicine residency at Duke. After her residency, she completed a gastroenterology fellowship at Wake Forest while Jerome earned his PhD at the Wake Forest School of Medicine. McKay said he encourages Hastings College students to take on change in their lives in order to become a stronger person. “Don’t be afraid of change because that’s often when you grow the most. I would tell Hastings College students to trust your gut and if you want to do something, research it and just go for it. Nine time out of 10, it’ll work out for you and you will grow from it,” said McKay.